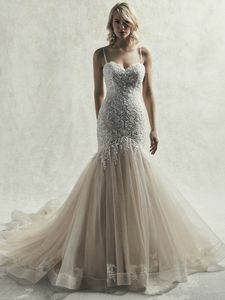 Description: This exquisite mermaid wedding gown features a bodice accented in beaded lace motifs, crosshatch detail and Swarovski crystals, accenting the sweetheart neckline. Sparkling tulle fit-and-flare skirt trimmed in horsehair and lace motifs along the hemline. Lined with shapewear for a figure-flattering fit. Finished with crystal buttons over zipper closure. Detachable beaded spaghetti straps sold separately.